Milk & Honey is truly one of America’s finest ice cream parlors. Featuring local, natural, organic and GMO-free ingredients, all frozen desserts are made in-house. 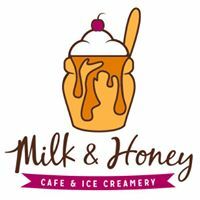 Famous for their ice cream, as well as their organic crystal homemade fudge and caramel, Milk & Honey also offers vegan ice creams for the lactose intolerant, ice cream cakes, a full coffee bar and a small deli. Facebook here. All menus here.